This Civil War Harper's Weekly has a variety of important stories and pictures. It shows the events unfold as they happened and are reported to eye-witnesses to the events. The paper covers the Battle of Harper's Ferry, one of the early conflicts in the war. It also has important content on the Annapolis Naval Academy and scenes of the destruction of the Norfolk Navy Yard. REFERENCES.—1, Catholic College.—2. City Hotel..—3. Battery.—4. Capitol.—5. Midshipmen's Quarters.—6. Constitution.—7. Recitation Hall.—8. Chapel.—9. Observatory.—10. Officers' Quarters.—11. St. John's (Episcopal) College.- 12. Hospital.—13. Monument—the same that was in front of the Capitol at Washington.—14. Naval Monument. GENERAL VIEW OF ANNAPOLIS, WITH THE "CONSTITUTION" IN THE FOREGROUND. WE publish herewith a series of views of Annapolis, from sketches made by one of our artists who is now traveling for us through the South. Our illustrations consist of, 1. A GENERAL VIEW OF ANNAPOLIS ; 2. TILE PRACTICE BATTERY ; 3. TARGET PRACTICE THEREFROM; 4. THE NAVAL MONUMENT IN THE SCHOOL GROUNDS; and, 5. THE MIDDIES LEARNING THE ROPES ON BOARD THE "CONSTITUTION." Every body knows that Annapolis is to the United States Navy what West Point is to the Army—the great training school from whence our gallant navy officers are sent forth to fight the battles of their country. "At 4 o'clock P.M. of Monday, April 22, the Seventh Regiment first landed in a hostile State on a military errand, and was disembarked at the dock of the Naval School at Annapolis. The men marched ashore by companies in good order, and formed in regimental line on the beautiful parade-ground in the rear of the Naval-school buildings. from the orchards and gardens on every side floated the delicious fragrance of peach and plum blossoms, there being now thousands of these trees in full bloom. At irregular intervals about the grounds were haycocks, lying as the mowers had left them a few hours before ; and the enchanting odor of new-mown hay added still another charm to the scene. Tired soldiers, just from the cramped discomforts and foul smells of a three-days' sea-voyage in an overcrowded boat, could never have had a more welcome sight or one of greater beauty. After a short inspection, the men were given leave to rest, when they stretched them-selves on the bright green grass, or tumbled in the new hay, in a perfect glory of delicious luxury. Under some trees, where every gentle breeze covered them with the pink fragrant peach blossoms, the howitzers were drawn up, loaded to the muzzle with cannister shot: To have fired those cannon the gunner must have stood up to his knees in new-mown clover, and have brushed away the flowers from the piece before he could apply the match." 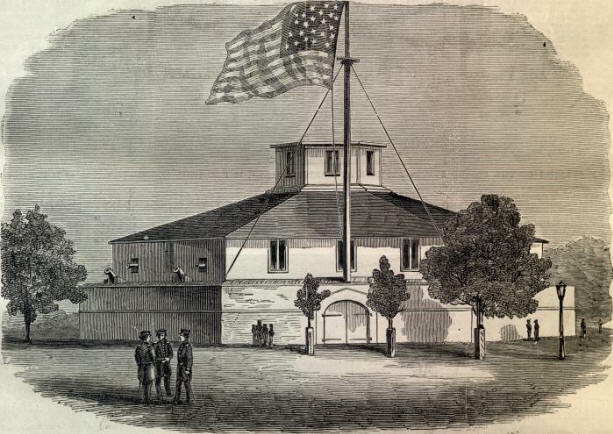 THE PRACTICE BATTERY AT ANNAPOLIS. TARGET PRACTICE FROM THE NAVAL BATTERY.